We sometimes carry our laptop at the church and at the end of the service after we have taken our lunch the ministers watch videos of fellowship abroad. Since the internal speaker of the laptop is not enough they connect it to the giant speaker in the church. Well it suffice but I was thinking if we have a portable speaker with us we don't have to connect it to any speaker but our own compact one. 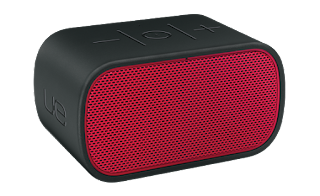 This portable compact speakers from Logitech is the solution for that need because it's powerful enough for our requirement yet lightweight enough to carry anywhere we go. It's taking great-sounding audio to anywhere we want to go. It can be used in our home and to any place we want to use the laptop for audio and video. The speakers has long battery life, easy to carry and can connect to smartphones and tablets using the latest in Bluetooth wireless technology. You can leave your charger at home because its rechageable battery can match the longest need for it. This mobile boombox can also be a speakerphone with built-in mic. Now you can go from listening to music to taking a hands-free phone call. You can talk or chat to your friends and family, then get back to the music without missing a beat.